This is very much a beer first and a dessert second, it is brewed with our trusted pale ale malt and a secret blend of complex sugars. The initial sweetness of Sticky Toffee Pudding Ale is tempered by a gentle bitterness from two of England's most traditional hop varieties- Fuggles and Goldings. 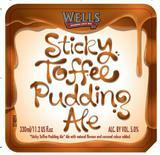 This delivers the sweet taste of caramel and toffee along with a smooth and robust aftertaste.